What makes Agency Access unique? Agency Access is my go-to recommendation for photographers needing advanced marketing services or portfolio building and editing. I am not affiliated with Agency Access in any way and gain no referral income or anything like that. I’m just happily recommending their services because of the good things I’ve heard about them from fellow photographers. Recently, I had a conversation with Keith Gentile, President & CEO of Agency Access and learned a lot about their services and what the potential gains could be from working with them. 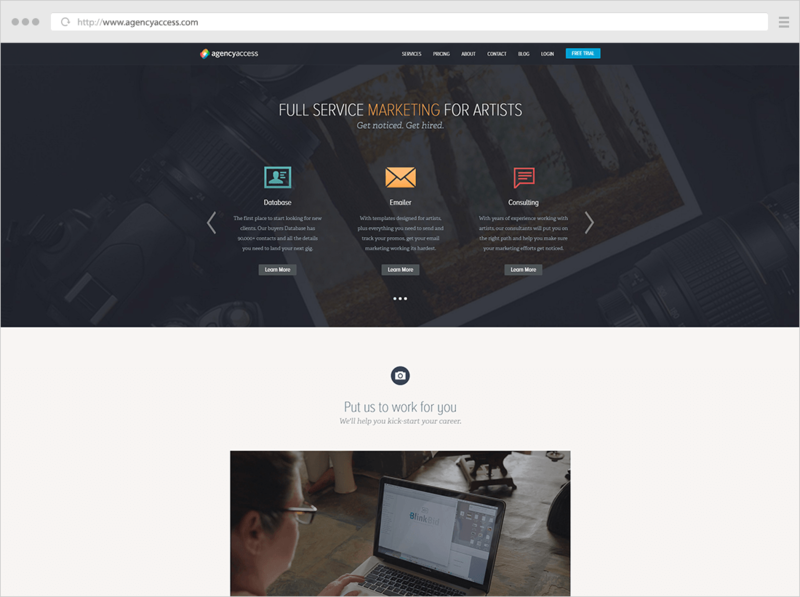 Agency Access is a full-service marketing agency for artists. They specialize in photographers and illustrators, but they don’t stop there. They also work with stock and motion. The two most important components to making your business succeed are having a target market and a vision based portfolio. If you lack in these two areas, most marketing strategies will fall short. What Agency Access does best is gets you to a point where you feel confident in your abilities to serve your clients. Why is a consultation a good idea? Because they help you assess your existing work, define your goals and give you the necessary steps to reach them. The consultants at Agency Access don’t impose a direction on you. Instead, they draw out what artists usually know, deep down, is what they really want for their business. Once you and your consultant come to a conclusion of where your work should be based on the skill sets you’ve both worked to define, they will make recommendations of what your target market should be and how to get yourself to a place where you are happy. Both a portfolio and web edit will give you insight from a former Art Buyer to help you select and sequence your images in a way that will appeal to buyers. For example, Jennifer Kilberg, an Agency Access consultant and former Photo Editor, will ask you to gather approximately 250-500 images and send them over to her. Once she has your images she starts your edit, creates the categories, paginates your work and then hands the complete package back to you, the artist. One of the things I truly appreciate about Agency Access is that they really care about the artist. They work hard to understand and fine tune who you are so you can get out there and succeed. The portfolio build requires about six months of test-shooting. It takes time to build up your body of work in order to be in a position where you feel confident in what you have or ready to make a market shift. You have to be ready and willing to get your hands dirty as this service is definitely a hands-on approach. You will concept and engage in test shoots, create your positioning statement, try your hand at some creative treatments and so much more. The result: a beautifully curated portfolio with a clear vision. You can purchase access to their database loaded with over 90,000 global contacts, email credits and print services which allow you to manage your marketing campaign on your own. While you can purchase each service a la carte, when you combine data, print and email together you end up with a marketing campaign that is proven to work. Weather you have a studio manager or spouse helping you out, Agency Access has the resources to help you get hired. Agency Access’ full service programs are 15 months and include a Campaign Manager, to stay on top of your schedule and program, a Consultant to help guide you in your market, edit your promos and website and help you build a targeted list, and a Designer to create & code email and direct mail promos. At the end of the day, you’re hiring Agency Access to be your very own marketing department! However, this is no magic pill. It is not a sprint, it’s a marathon. While you may land a job for your dream client, it is going to take a few months or years before your hard work pays off. The secret ingredient to making it all work is time. As often the case, time is that required ingredient. “People come in, and sign on for one of our full service marketing programs and don’t land their dream client right away and they say “Oh, I guess it’s not for me”. I’ve known about Agency Access for many years now; they’ve created an interesting business model that changed the paradigm of how photographers market themselves. When it comes to consulting, Agency Access puts a lot of time into research and building their team of consultants. It’s important that the individuals in this role have industry experience; that they know what they are talking about. Credibility is key. Most of their consultants have 10+ years before signing on to consult. Consulting is arguably the most important aspect when you are starting with marketing. The experience of working with someone who knows the industry in and out has the potential to change your career. If you’re interested in hearing more about how Agency Access works or you’re ready to jump in and get started, you can contact Dan Caruso, Director of Accounts at Agency Access (dcaruso@agencyaccess.com).